With so much focus on burlap and antique grain sacks we are starting to see a trend using other utilitarian products in home decor. Many years ago my father found a huge box of upholstery webbing at the dump. As a child of the depression, and not one to waste, he rightly scooped it up and brought the box home. 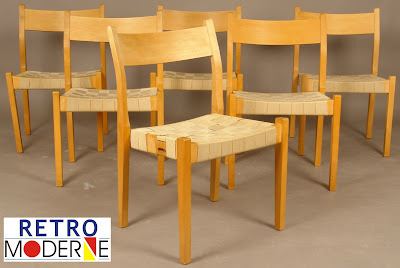 Similar to the photo above, he took chairs with broken rush seats, probably also acquired from the same dump, and wove new seats out of the webbing. We used them for years in our cottage on the Cape. Click the picture link to learn how to do it yourself. 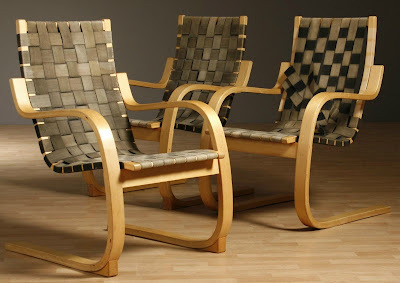 Of course it wasn't a unique idea-Scandinavian designers have been using cloth webbing for ages. Both photos above from Retro Moderne give you the basic idea. But I am really intrigued when I see the upholstery webbing in more unexpected places. 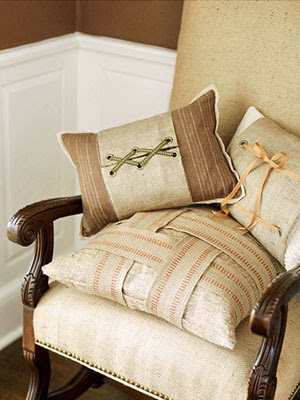 Here are some fabulous pillows -adding some webbing is a simple way to bring the burlap look into your home. This pillow above is wrapped with one length of webbing. The webbing costs about .50 cents a yard - so wrapping the pillow this way is very inexpensive. 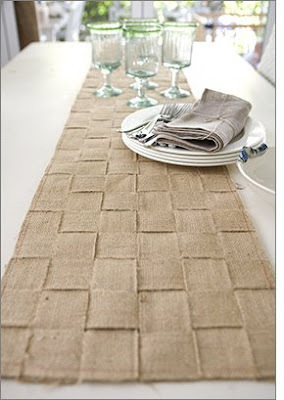 Here is a fabulous jute table runner from Tara Dennis. Click on the link to learn how to craft this yourself. 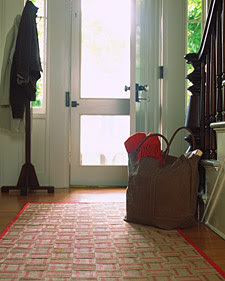 Always in the front of pack in terms of trends is Martha Stewart, with this lovely webbing hall runner. The link will also show you exactly how to make one for your home. 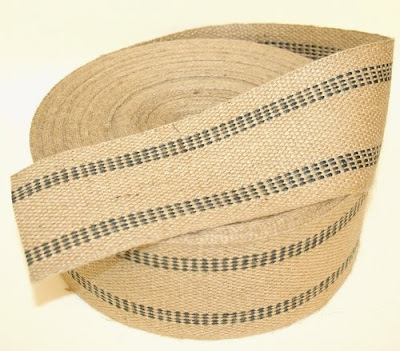 If you're feeling really crafty you could stitch up a few of these jute webbing napkin rings. I prefer the webbing when it is woven. This is a photo of a display wall in Anthropologie. Not sure how this would translate in everyday living, but its an interesting look. 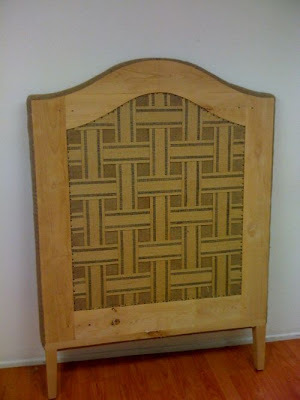 This is the back of wonderful headboard designed by Steve Giannetti. It is so pretty I think I might want to display it this way. Here is another shot of Steve's bench. 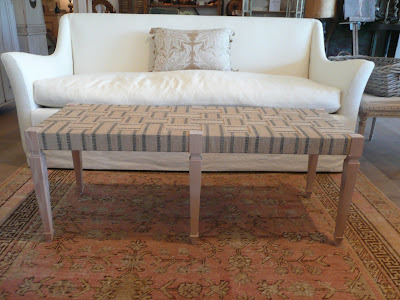 You can learn more about both projects at Velvet and Linen. The headboard here and the bench here. 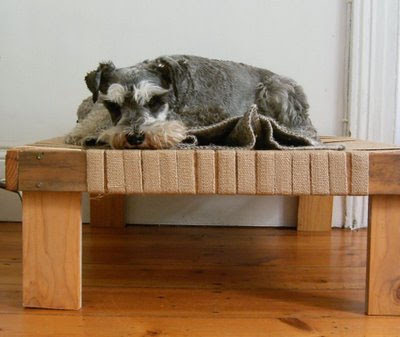 This little pooch looks happy on his new upholstery webbing bed - very clever! 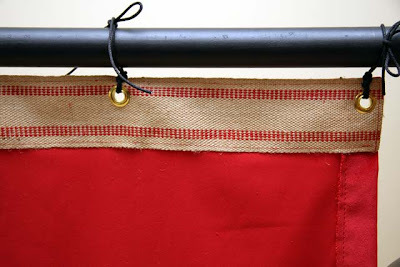 I really like the webbing detailing on this curtain - great for a play room. 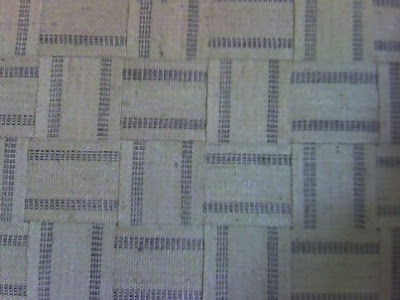 Here the webbing is used as a background for art at the Shabby Nest. 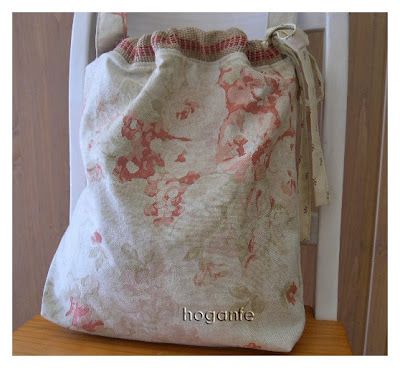 Here is an interesting bag from Hoganfe, a seller on Etsy. The webbing is used around the drawstring top. Finally we see a mix of webbing used in other ways from Sadie Olive - to the left is a memo board weaved with webbing and the lower right picture shows the webbing wrapped around a stack of antique books. Charming. I'd love to hear about any other creative uses for this inexpensive material! 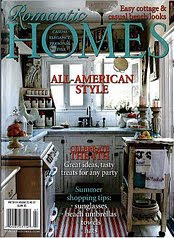 Check out Southern Hospitality for other great ideas here !! Garland for an organic looking Christmas tree, pair it with Vetiver balls for ornaments, mini ironstone pitchers tied on to branches with twine and finally some mercury glass finials for bling! As someone who is in a shop, thank you, thank you for those great ideas. I have used it to display pictures...pin jewelry to for attractive storage and in a number of art projects...it is versatile, tough and has wonderful texture. This is a great post! Thanks for the inspiration! Fun ideas! I remember taking an upholstry class years ago and buying the webbing, not giving it a second thought as to how else it could be used. Wonderful post! I love the webbing and I am currently working on fun designs with it. Love all of your photos. Thank you for sharing. 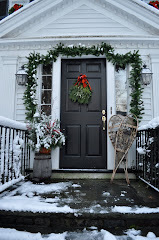 I recently found your blog (can't remember whose sent me your way) but I just love it!! I bought some webbing a while back and can't remember what the fab idea for it was but this post today is just bursting with creativity. Thanks so much! Love the Belgian post also. Fabulous post- I'm burlapped out and in need of inspiration- thank you! So many great ideas, I don't know which one to choose! I think I'll be looking into that bench and the napkin rings! You did some research on this, lady! Nice job! Well, I guess I'm off to find some jute webbing...what amazing ideas - thanks for sharing them! Love this - esp. what Steve G. made - that is so fabulous! Love the napkin rings made from the webbing, very unique idea. Oh I love this post. Webbing is one of my favorite things! I love this post, and the little dog is so cute! What an interesting and innovative style. I love it! Wow, I had no idea there were so many cool things you could do with this stuff! 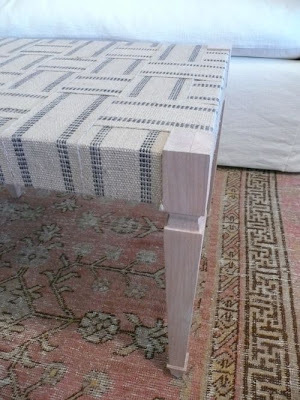 I'm going to have to copy that table runner idea, its great! We just saw this stuff at Capital Iron in Victoria, and were wondering what we could do with it. Great TT! Love this idea. for most of the projects seen here, visualize an additional embellishment to the webbing itself. 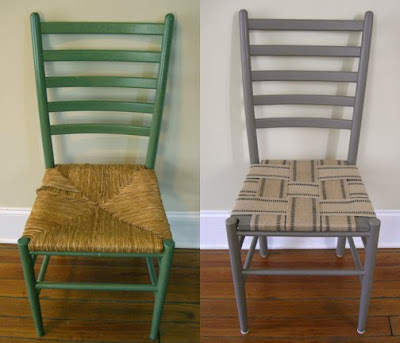 For application: use fabric paint and a rubber stamp. I am totally inspired. 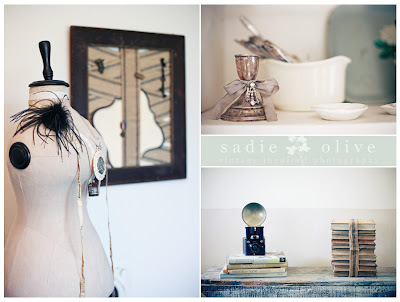 Love the runner and napkin rings. Thanks for the good ideas. 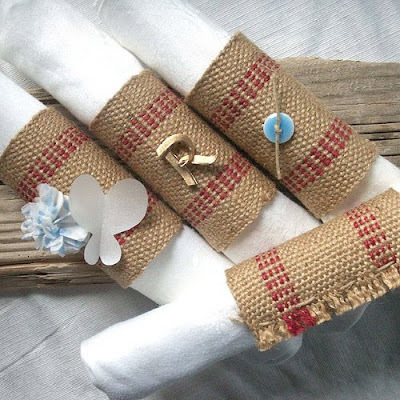 I do love those napkin rings and runner...all of them great pictures and ideas! Great post! Don't you just love it when people use utilitarian things in new and beautiful ways? Fabulous post! What a wonderfully, inspiring post! Thank you so much. Oh my, you are so creative! Thanks for all the great ideas! What creative uses for this material! I love all the ideas and it never ceases to amaze me what people think of...we really do love beauty, us crazy humans, don't we? I love the texture of this material, lovely to behold. What a great post! I love all the ideas for jute. I never ever thought of all these uses! So many ideas, so little time! I LOVE some of these ideas! Thanks for giving me the link. Some of them are what I had in mind to do with my webbing, but you gave me some new inspiration. 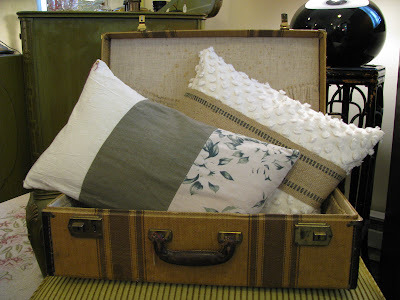 I have some nubby chenile, so I am definitely doing that pillow. And I love the shadow box. By the way, I love your blog. I linked to one of your kitchen pictures as inspiration for my kitchen last week. I hope to hear more comments from you in the future!